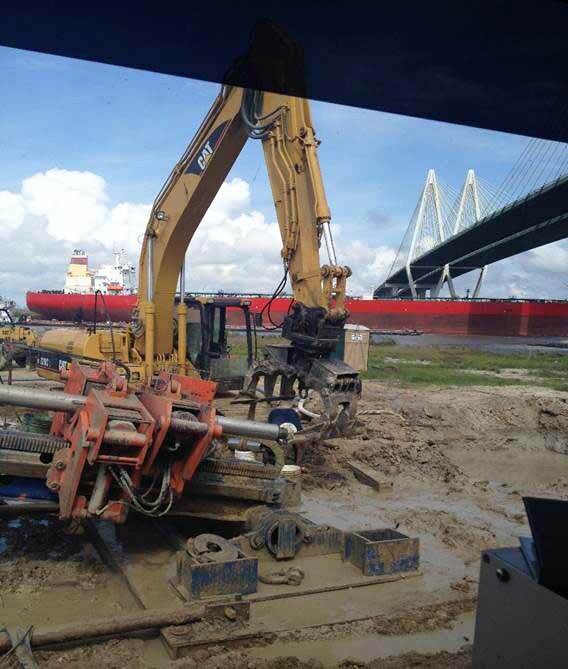 Janco Drill Record: Back in 2006, Janco broke the 8,000' barrier by successfully completing the installation of a 10" pipeline in the Houston Ship Channel for Oil Tanking Company Inc. Since that time, Janco has successfully completed 12 more HDD's of over 8,000'; 5 of over 9,000', and one at 10,400'. Pipe sizes have ranged from 6" through 24" for these long HDD's. With the new technology and equipment currently available, coupled with Janco's experience with long drills, we feel confident that Janco can successfully exceed 3 miles with HDD installations in many soil types and varying design criteria. In the picture, had Janco design and build this pull head assembly. Dedicated Team: Janco has a broad base of successful experiences installing water to water HDD's, as well as land to water installations. Janco has successfully completed over 2,500 HDD's since our conception from 1984 to 1994. We have successfully installed many large diameter single pipe and bundle installations over the years. These have ranged from 48" single pipes, as well as up to 6 pipes of various sizes in the same borehole. Janco's environmental abilities, equipments, and procedures have grown with the demand as concern for our environment has evolved over the years. Janco has increased our mud reclamation capacity by over 500% over the last few years. We have also added a new high capacity center fuse system to our mud handling equipment. Janco plans on being the leader in procedural changes coupled with the latest technology and equipment innovations, in our ongoing commitment to minimize environmental impacts that can occur when using HDD installation methodology. We are completely confident that Janco shall be in the forefront of developing zero discharge procedures during the construction of HDD installations. Under the Fred Hartman Bridge, Crossing the Ship Channel for Oxy/Chem pipline bundle. Design and Build Services: The key to success in any type of venture has always been to evolve from a foundation based on complete and thorough knowledge of a proposed project, a detailed planning program, and focused execution carried out by qualified personnel. At Janco, we pride ourselves on having dedicated, properly trained, responsible personnel at every level of our operations. If you have an HDD project that requires detailed survey and technical discovery, then putting it all together in a design package that is safe, constructable, and environmentally responsible, you owe it to yourself to have Janco put the wheels in motion for you. We can provide you with a timely, practical procedure and plan that shall be designed for success from concept to completion.